October 27, 2018: With many of us Dubai and GCC residents enjoying apartment living, the award-winning Space Grill is an amazing new-to-the-region cooking solution for those who enjoy a little al-fresco balcony dining but don’t have the space for a full-sized BBQ. Developed as the ultimate outdoor cooking solution, Space Grill is your perfect, fold-away BBQ for those with limited outdoor space. Whether you have a smaller garden, a compact terrace area or balcony, you can now enjoy the delightful aroma and overall enjoyment that a BBQ brings. As the adage goes, necessity is the mother of invention. Founder and inventor of award winning Space Grill, Ryan Martin, tried to find such a barbecue for his modest balcony on the sunny Gold Coast of Australia. Failing to find anything remotely suitable – and being a big fan of outdoor cooking (like any self-respecting Australian), as well as being fairly handy – Ryan decided the best solution was to make his own. Having designed and made his very first barbecue, friends of his started saying they wanted one, and so Space Grill was born. Space Grill is the only indoor approved fold-away BBQ and boasts a patented design that allows it to quickly and easily pull down from its vertical storage position to a horizontal cooking one, allowing you to grill in just ten seconds. 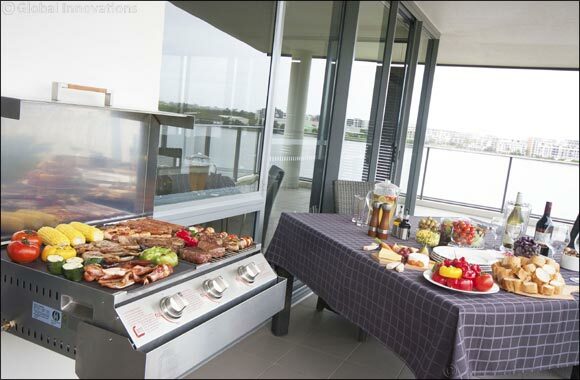 Completely space saving, Space Grill can be set up or packed away in seconds, maximising your outdoor living space. Space Grill is a very design led barbecue, both in terms of appearance and functionality, making a Dubai launch seem particularly relevant given the large number of “space poor” urban dwellers”. Space Grill has proved to also have broader appeal, with those who deem regular barbecues either an “eyesore” or “clutter” drawn to the retractable convenience and discrete aesthetic offered by it. Weighing a reassuringly “well built” 35kg, Space Grill only has a pivot weight of 15kg, and with the aid of inbuilt handles on its sides, moves between positions with little effort. When retracted back down, Space Grill occupies almost 70% less space, protruding a fraction over 20cm from where its bracket is affixed. Offering complete gourmet cooking, Space Grill has three stainless steel burners and a surface area of 640mm x 480mm consisting of an anti-stick ceramic coated cast iron plate, both flat and ridged, as well as a chef grade stainless steel grill, ensuring plenty of space to cater for family and friends. Space Grill couldn’t be easier to keep clean and well maintained and a notable feature is its internal drip system which ensures any excess fat is captured in a detachable and pivoting drip tray. Ryan explained: “I love cooking on the barbecue, but I do hate cleaning, which I’ve tried to make as painless as possible”. His tip is to drop the Space Grill into the storage position so all the run off collects very quickly in the drip tray, and then “pop off” the tray and take inside for a quick clean. The unit’s cavity is shallow and every corner and surface easily wiped clean. (And the easier something is to clean, the more often it will be used). Recipient of the prestigious 2016 Australian Good Design Award for “Best in Category”, SpaceGrill - the world’s first full-sized, three burner “fold-down” barbecue - is officially launching in Dubai and the wider Middle East region this month. Ryan and the SpaceGrill team turned their attention to the Middle East for obvious reasons: a country with a strong appetite for barbecue and grilling, a region with a harsh weather climate where it isn’t always possible to cook outside and whose inhabitants frequently have little or any outdoor space due to widespread apartment living. While the main goal was to create a space efficient full-sized barbecue, every effort was made to ensure Space Grill incorporated stylish and discrete design, as well as a number of carefully considered features to make it incredibly simple to operate, clean and store. Space to grill in 10 seconds: Aided by inbuilt handles, the patented design allows quick and easy transfer from vertical storage to a horizontal cooking position – and then back again after. Space efficient: When retracted down, SpaceGrill occupies almost 70% less space, protruding a fraction over 20cm from its mounting bracket. Easy to clean: The anti-stick ceramic nano coating is easily wiped clean, while SpaceGrill’s patented internal drip system ensures all run off is captured in a detachable tray that is easily removed and cleaned. Durable: Made from high-quality weather proof stainless steel that’s easy to clean and is highly corrosive resistant to moisture and salt. Power: The three individual rotary ignition stainless steel burners can operate off bottled or mains gas, with gas outlets on either side offering greater flexibility. The Space Grill will retail at the same price as in Australia of AED 3799 including VAT and will be available from October 2018 through select retail partners and online .